Pittsburgh, PA… The Groundbreaking Ceremony will be held on August 23, 2017 at 10:00 AM at the corner of Jancey/Greenwood Sts in Morningside. 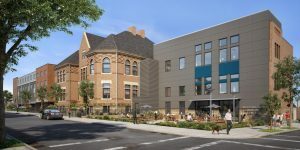 a.m. RODRIGUEZ ASSOCIATES inc., would like you to join us as we celebrate the groundbreaking of Morningside Crossing, a coordinated community revitalization effort with City of Pittsburgh and the Urban Redevelopment Authority (URA) to produce affordable and market rate, senior living apartments. Morningside Crossing includes the adaptive reuse of the former Morningside Elementary School (ca. 1897) plus two new wings to accommodate; a) forty-six (46) senior 1- and 2-br apartments, and b) the new Morningside Community Center, which will house the Morningside Senior Center. The Senior Center is currently housed in an old fieldhouse four blocks from the site. With the support of the URA and the benefit of low-income housing tax credits, 39 of the units will be affordable to people whose incomes do not exceed 60% of area median income (AMI). Seven units will be market rate. Half of the units have projected rents that will target those whose income is 50% or less of AMI, with 5 units affordable at 20% AMI, 3 of which are for mobility impaired residents. a.m. RODRIGUEZ ASSOCIATES inc. will coordinate the development activities to ensure that the buildings maintain the architectural integrity and amenities admired at all existing properties within the a.m. RODRIGUEZ ASSOCIATES inc., portfolio. Morningside Crossing will be designed and built by an expert team of professionals with extensive experience in creating attractive, highly sustainable affordable housing. Thoughtful Balance inc./NK Architects has worked with a.m. RODRIGUEZ ASSOCIATES on several affordable housing projects in the past, and Sota Construction Services., is on the forefront of green technology and has experience in projects that meet the standards for Leadership in Energy and Environmental Design (LEED) green design principals and designing Passive House projects.